I have a new favourite app (after Clips… sort of) that I suggest every teacher that uses iPad in their classroom must use, Apple Classroom. 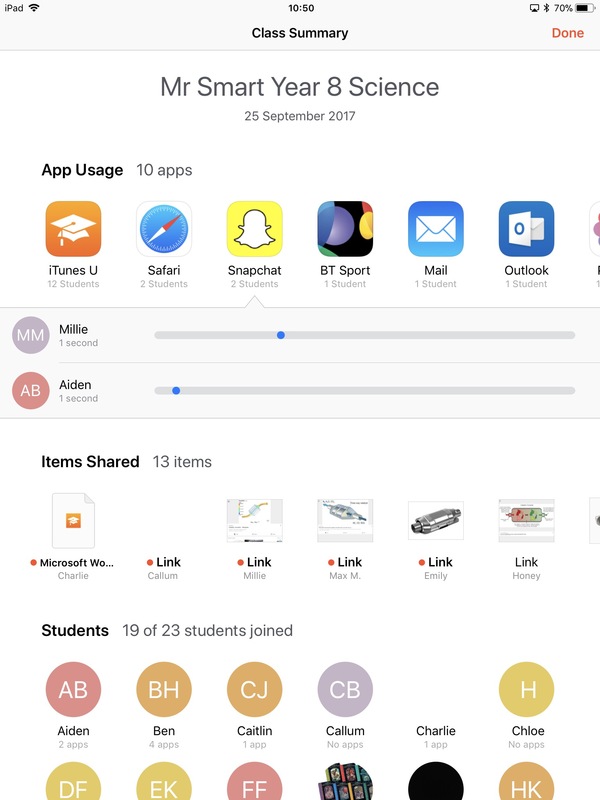 Ever since the major update this summer that has meant that you no longer require an MDM to set up, Apple Classroom has been going from strength to strength and the development team have obviously been listening to the requests from teachers. When teachers are relatively new to iPad in the classroom, Classroom can make the transition an easier and smoother process. Less confident teachers worry about the lack of ‘control’ that iPad may bring to the lesson but Apple’s latest must have app for education is supporting teachers so they can focus on teaching and the students can focus on learning. Easy to set up, easy to use and students do not need to download an app! Remote Control – Launch apps, websites or iBooks on a students device, a group of students or on every iPad in the class. Screen view – Glance at any screen on your classroom with just a tap. Share work on the Big Screen – Project any student’s screen on an AirPlay enabled screen. Mute – Mute all devices in the room when Clips soundtracks are being chosen! Lock devices – Lock student’s devices during teacher talk. Air Drop – Share resources from the teacher device to all students with just one tap. Bluetooth Connectively – No MDM required to set and use. Students automatically join the Classroom when they enter the class. For more information on how to use Apple Classroom click here. 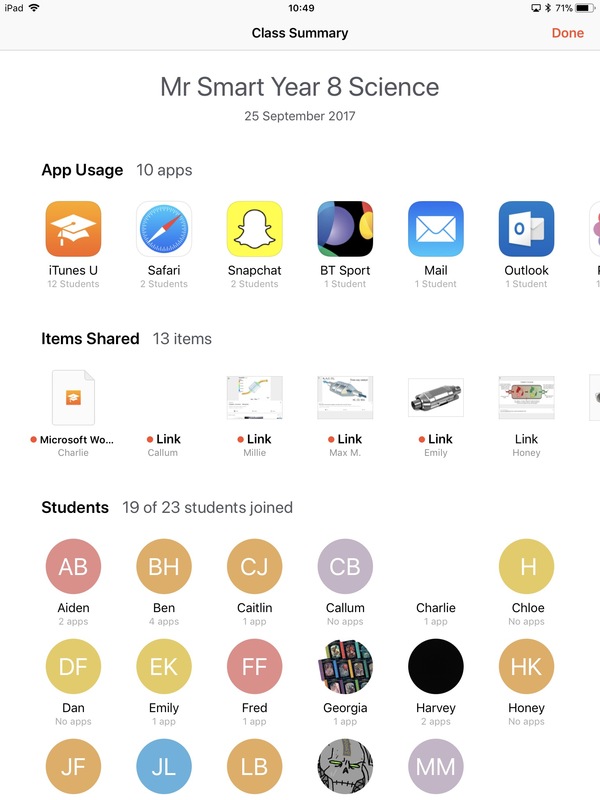 One of the best features about Apple Classroom has been the Class Summary which arrived in the latest update (September 2017) Class summary allows you to view information about the student’s use of their iPad during the class. The Class Summary pane appears automatically when you end a class . 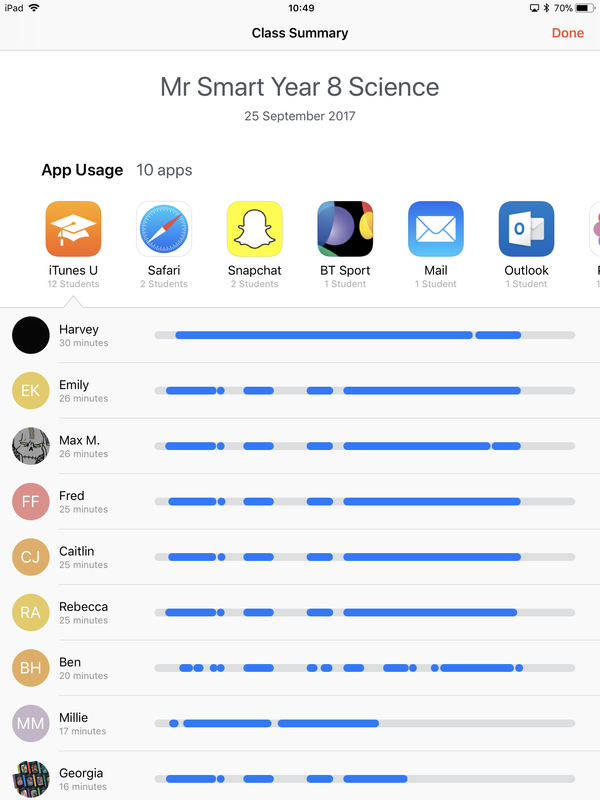 App usage: What apps were used by the students and the length of time the students used them during class. Items shared: Documents or websites shared by the students. Student list: The list of students that participated in the class. Apple Classroom is truly amazing and just what every teacher in an iPad classroom needs to help students and guide them through their learning without loosing ‘control’. Using iTunes U and Apple Classroom to their try potential can help students and staff get the most out of iPad in their classroom without spending a penny! Posted on September 25, 2017, in General. Bookmark the permalink. 3 Comments. Great work Gav. I have now installed this and look forward to having a go with my year 7’s. I love this too and have set it up for our 32 shared iPads. The only thing that I am not sure about is when usin the LOCK feature, a pop up message appears on the students iPads, asking if they want to allow the teacher to lock their devices. Of course they aren’t going to say yes. Hoe do I stop this? When students join the class they have the options what happen when you lock. I think they are always, never, request permission. I think you can restrict these choices using a certain set up of a profile within MDM. or a conversation with students who change the settings!